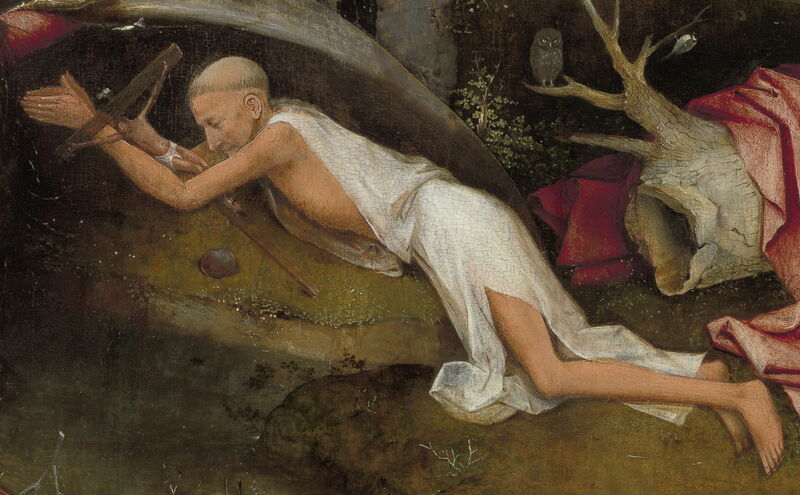 Hieronymus Bosch (c 1450–1516), Saint Jerome at Prayer (detail) (c 1485-95) (CR no. 1), oil on oak panel, 80 x 60.7 cm, Museum voor Schone Kunsten, Ghent. Photo Rik Klein Gotink and image processing Robert G. Erdmann for the Bosch Research and Conservation Project, via Wikimedia Commons. This early painting of Bosch’s name saint is strikingly original, with details which are becoming increasingly sinister and idiosyncratic. Saint Jerome, in Latin Eusebius Sophronius Hieronymus, was the saint whose name Bosch bore, and the artist would have been told a great deal about him since childhood. A great scholar and author, much of the Latin translation of the Bible – known as the Vulgate – was performed by Jerome. After he received the vision which led him to devote himself to God, he underwent ascetic penance in the desert of Chalcis, to the southeast of Antioch. After a demanding career in the priesthood in Rome, from the late summer of 388 until his death in 420 he lived and worked in a cave near Bethlehem, which had been claimed to be the location of the birth of Christ. This period was among his most productive in terms of writing. His attributes are a lion (from dubious hagiography), the conventional rig (especially hat) of a cardinal (although at that time there was no such office), the cross, skull, trumpet (of the Last Judgement), owl (as a sign of wisdom), books, and writing equipment. Most paintings show him working with books and writing in the desert, although it is unclear whether this refers to his period of penance at Chalcis, or to his ascetic lifestyle at Bethlehem. 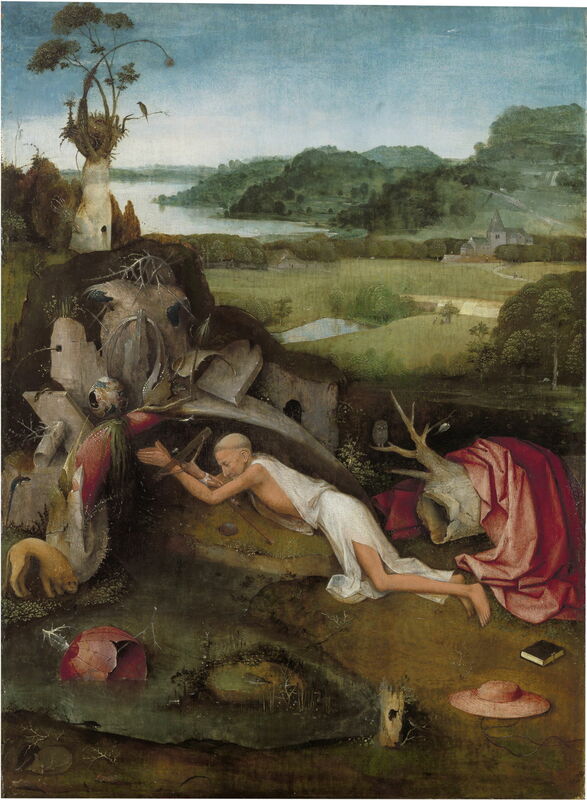 At the lower centre of the painting, Saint Jerome is seen at prayer, lying prone under a rock shelter. This is set in the rolling countryside near a large lake, among trees and fields. The Saint is shown as an old man, almost bald apart from a ring of short hair around his head; he is clean-shaven, and wears a clean white habit which exposes the left side of his chest, his left leg, and arms. The palms of his hands are held together, almost in line with his head and body. He embraces a large crucifix with a lifelike miniature body of Christ on it, between his forearms. His eyes are closed in concentration. Surrounding him are some of his traditional attributes: near his feet is the scarlet broad-brimmed galero (hat) of a cardinal, and there is a closed book by it. Further behind, the scarlet cassock of a cardinal is wrapped around a hollow section of tree-trunk, on which is perched an owl. In front of his chest is a small, smooth rock, with which he may have been beating himself in mortification, although the flesh which is visible is unmarked. In the foreground there is a small circular, muddy pond, within which is another circular area of water, on which there is a duck. Near that is part of a red globe which looks like the outer skin of a red onion, into which pieces of white thorn twigs are pierced. On the bank nearest the viewer there is am unusual newt-like creature, more thorn twigs, a sleeping fox curled on itself, and the head of a cockerel. On the further bank is a little lion, and small white flowers. The rock shelter around the Saint appears thin, almost cast into a shell. Above it is a collection of curious objects, including a clump of green alga or seaweed with long strands dangling, a large red cushion-like area with white spots, a multi-coloured sphere with a hole in its side, various thorn twigs and other plant fragments, a tombstone, a stone pedestal, several newt- or lizard-like creatures, and various plants. The almost black hole shown above the rock shell half way along the Saint’s back has recently been discovered to contain a second owl, keeping watch on the first. Further into the distance on the left is an unusual form of tree with a very thick, smooth and almost white trunk. Its top contains a large birds-nest, in which there is a bird, and a single egg. Branches rise up from the nest, one of which passes in an arc to the right, where it terminates in some sort of flower. Another bird sits on a horizontal branch. The rest of the surrounding countryside is more conventional. The land drops to a couple of lakes, with a woman washing clothes in the further of them, and there is a wood behind and to the right. It then opens out into pastures with pale bleaching fields, behind which a track curves to a church with a tower, set in a belt of trees. Further into the distance the land rises more, into small hills with patchy woods and trees. On the left these drop to a large lake. The sky is almost free of cloud, with some small wisps only. However the light appears flat, without distinct cast shadows. Bosch’s painting fits the diagonal figure of the saint and most of the more relevant detail into a horizontal band whose top is the (horizontal) centreline of the panel. Its countryside is most probably a temperate European re-expression of Bethlehem and the Sea of Galilee, implying that it shows the Saint during the latter years of his life, not when paying penance in the desert earlier. Although it is often assumed that artists conflated Jerome’s early spell in the desert with his later 32 years living in a cave at Bethlehem, evidence in earlier paintings is that most showed one or the other. Andrea Mantegna (1431–1506), St. Jerome in the Wilderness (c 1448-51), tempera on panel, 48 × 36 cm, São Paulo Museum of Art, São Paulo, Brazil. Wikimedia Commons. 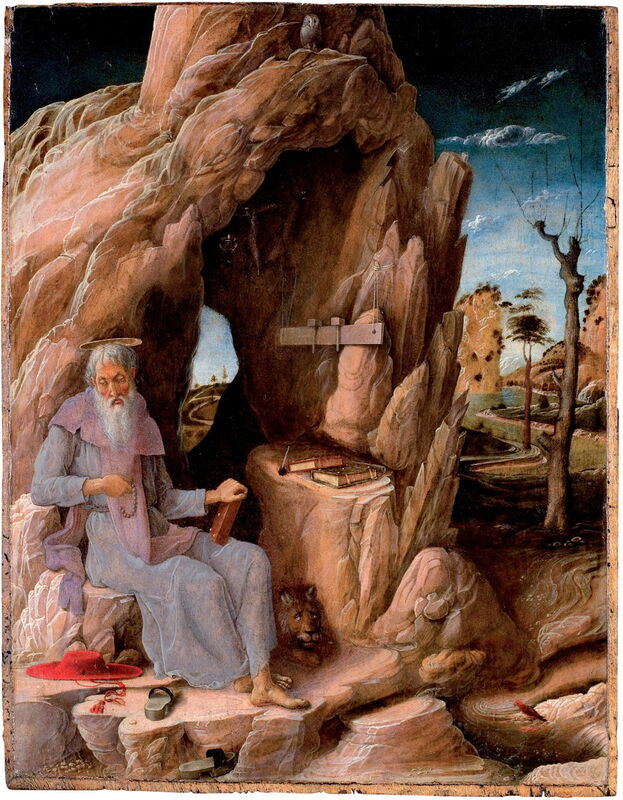 Mantegna’s earlier St. Jerome in the Wilderness (c 1448-51) opts for what became a more conventional composition in the desert, but anachronistically showing the Saint as an old and bearded man. In that sense it has a degree of conflation, although there is no ambiguity in the environs. Note that he squeezes his owl in right at the top of the panel. Lucas Cranach the Elder (1472–1553), St. Jerome in a Rocky Landscape (c 1515), oil on beech wood, 49 × 35 cm, Gemäldegalerie, Berlin. Wikimedia Commons. 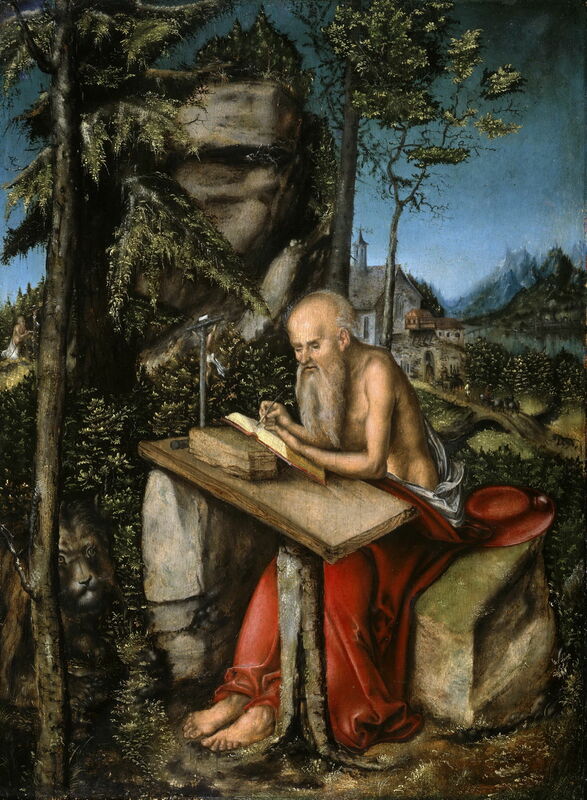 Lucas Cranach the Elder’s slightly later St. Jerome in a Rocky Landscape (c 1515) shows the Saint hard at work, writing, in a more alpine countryside, in which the lion seems curiously out of place. This is no desert. Battista Dossi (c 1490–1548), Saint Jerome Praying in the Desert (c 1548), oil on canvas, 106 x 153 cm, Musée du Louvre, Paris. Wikimedia Commons. 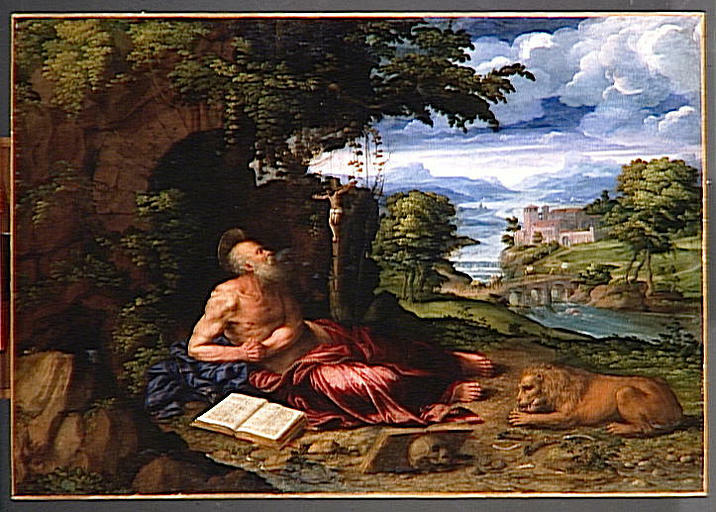 Battista Dossi (younger brother of the better-known Dosso Dossi) also opted for a pastoral waterside setting in his Saint Jerome Praying in the Desert (c 1548). This appears to have been mistitled, as it is anything but desert. 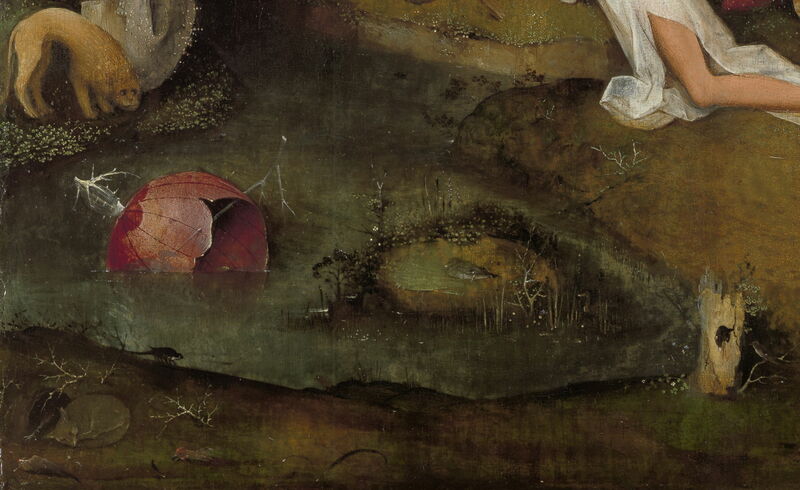 Apart from the saintly attributes, in which Bosch adheres to convention even to the rather canine lion, the immediate surroundings have many strange and preternatural objects, which have a slightly sinister air. The cockerel’s head may indicate that the fox is sleeping off a good meal, but is by no means conventional or expected. The thorns have direct religious references – to Christ’s crown of thorns, and to ascetic penance – but are also characteristic indications of a hostile and hazardous environment. Until the opening up of rural and wild areas during the Age of Enlightenment, for most of the population the countryside harboured fearful creatures and untold dangers. Bosch has here started to develop some of the forms which will become even more familiar in his later works. Some of these appear to be based on magnification of what would have been small, such as the curved object above Jerome’s hands, which resembles a spikelet of barley. There are also possible illusions of scale in the small pond in the foreground, which appears to contain a microcosm of country around the duck in its pond. The unfamiliarity of these objects brings an uneasy, almost morbid, fascination which is one of Bosch’s most distinctive and appealing traits. 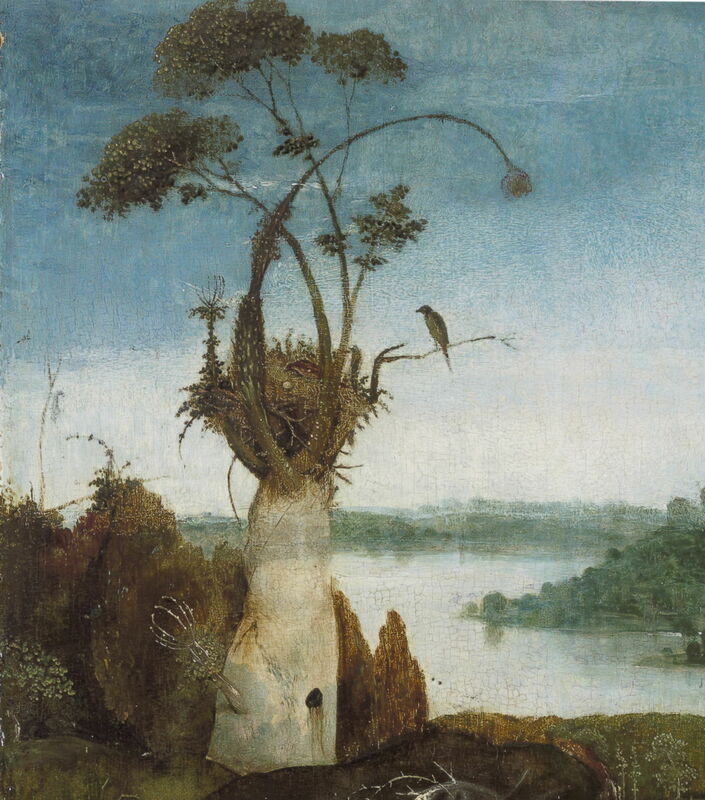 This painting also reveals the origin of Bosch’s signature owl, which first appeared in his Ecce Homo (c 1475-1485): the owl is an attribute of Saint Jerome or Hieronymus. Ilsink et al. also explain that Hieronymus was thought to be derived from gerar (holy) and nemus (wood); in Middle Dutch translation this becomes heylich bosch, giving the artist his professional surname of Bosch. This painting has not apparently been the subject of any dispute as to it being an authentic work by Bosch’s hand, neither does it appear to have undergone any alteration in its lifetime. Matthijs Ilsink, Jos Koldeweij et al. (2016) pp 110-121 in Hieronymus Bosch, Painter and Draughtsman: Catalogue Raisonné, Yale UP and Mercatorfonds. ISBN 978 0 300 22014 8. Posted in General, Painting and tagged Bosch, Cranach, Dossi, Mantegna, painting. Bookmark the permalink. 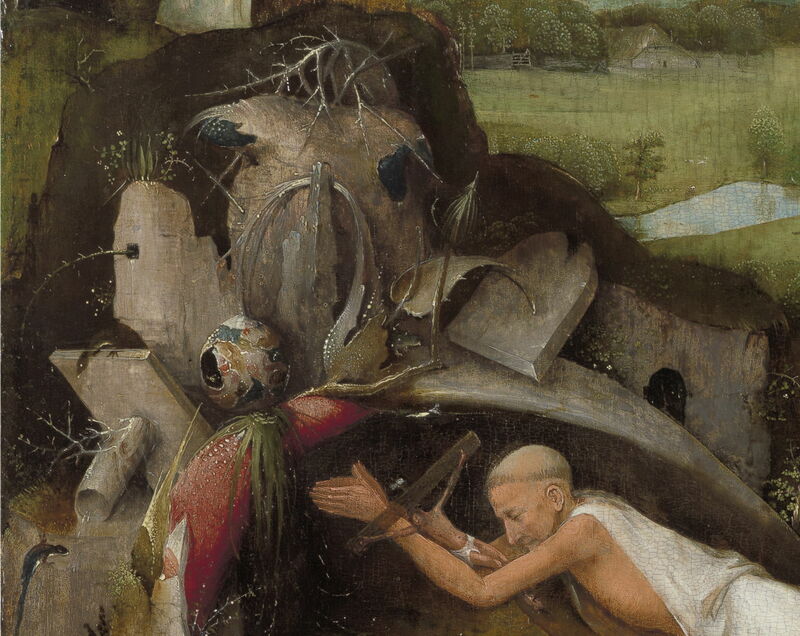 Thank you: we have many more wonderful paintings by Bosch to come still.